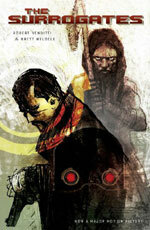 Synopsis: The year is 2054, and life has been reduced to a data feed. The fusing of virtual reality and cybernetics has ushered in the era of the surrogate, a new technology that lets users interact with the world without ever leaving their homes. It's a perfect world, and it's up to Detectives Harvey Greer and Pete Ford of the Metro Police Department to keep it that way. But to do so they'll need to stop a techno-terrorist bent on returning society to a time when people lived their lives instead of merely experiencing them. 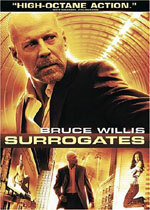 Additional notes: The book referenced here collects all five issues of The Surrogates, which was originally issued as a comic book miniseries in July 2005.